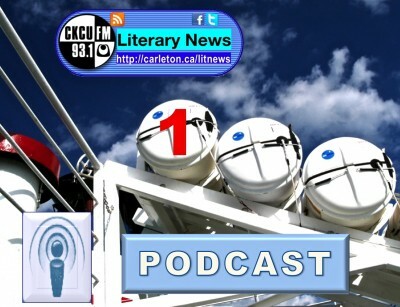 Radio CKCU/Literary News_PODCAST in English. litnews1pod75 Lucie Renaud, Editor in chief of La Recrue du mois, in conversation with Sean MICHAELS, who was awarded the prestigious SCOTIABANK Giller Prize 2014 for his debut novel ‘Us Conductors’ (Random House in Canada, and Tin House in the United States). litnews1pod74 ‘Charlie Hebdo’: Paris, January 7th, 11th, 14th, 2015. N. Chomsky, VOLTAIRE, P. Eluard. litnews1pod73 The New Year’s Eve Special, most lively indeed, dramatic in a way, because of a malfunction in the CKCU-FM LIVE studio that almost ‘glitched’ our plans for a very special broadcast. In fact, we lost about 10 minutes of content. But it’s quite fun, nevertheless. Take a listen, if you’re interested in hearing us trying to solve a computer problem while being ON AIR. litnews1pod72 The Christmas Eve Special / Une émission spéciale en trois langues / Unsere Sondersendung zur Weihnachtszeit. Georg Philipp Telemann, sonate methodiche; poetry by Frederick NIVEN, with a carol by GRAHAM FITKIN; about Bertha von SUTTNER (Nobel Peace Prize 1905) and Romain ROLLAND. Plus “3 virtuosi” celebrating the 1914 Christmas truce / la trêve de Noël / Weihnachtsfrieden 1914.
litnews1pod71 Feature interview with the internationally acclaimed, award winning Austrian theater actress MAXI BLAHA about her performance tour in seven countries with SOUL OF FIRE – SHE FOUGHT FOR PEACE – BERTHA VON SUTTNER, Nobel Peace Prize Laureate (1905), a monologue by Suzanne Wolf for Maxi Blaha, as staged in Saint Paul U (Ottawa), November 25th, 2014.
litnews1pod70 PATRICK MODIANO, recipient of The Nobel Prize in Literature 2014 “for the art of memory with which he has evoked the most ungraspable human destinies and uncovered the life-world of the occupation” (i.e. the German Occupation of France during WWII). Presenting selected aspects and focal points of the Nobel laureate’s (auto)fictional writings, the podcast (25 min.) includes material and suggested readings for further study. litnews1pod69 Edith Cavell’s heroic activities in Belgium during WWI, British creative writing for/against the war effort; and new European literature in translation – a conversation with CKCU Literary News Senior correspondent FRIEDERIKE KNABE. litnews1pod69 A feature interview with MILENA ODA, writer, poet, playwright and actor, film director, publisher who is living in Prague and Berlin. She is the author of several books, including the novel Nennen Sie mich Diener (Dresden: Schumachergebler, 2011), and a play entitled Mehr als Meer / See the Sea (Charleston, SC: Bohemian Paradise Press, 2014), German / Czech bilingual edition. litnews1pod68 A tribute to SEAMUS HEANEY (1939 – 2013), Nobel Prize in Literature, 1995.
litnews1pod67 Summer program, rebroadcast: Revisiting major international book fairs of 2014 with senior correspondent FRIEDERIKE KNABE. litnews1pod66 Summer program, rebroadcast: “Sigmund Freud and ‘Our Unconscious Mind'”- Dr. ROBERT RICHARD, writer and essayist based in Montréal, offering critical perspectives on Dr. John A. Bargh’s article ‘Unconscious impulses and desires impel what we think and do in ways Freud never dreamed of’ (30 Scientific American, January 2014). litnews1pod65 Summer program, rebroadcast: Award winning Irish novelist BILL KIRTON reporting for CKCU Literary News from the bilingual, English-French Festival of Literature, launched in 2012 at Saint-Clémentin, Deux-Sèvres, Poitou Charantes (France), including several interviews with fellow writers about the creative process of writing. litnews1pod64a Presenting the Summer program. litnews1pod64 The ‘Benefit Concert’ of June 21, 2014, for the Galai School / Africa Project, with JESSEE MATTHEWS, project initiator, in conversation about this faith based celebration of cultural diversity which is featuring ROBERT LAVIGNE, a metis story teller widely known as Jo Maple . litnews1pod63 Authors THOMAS ENGER, from Norway, JAKOB MELANDER, from Denmark, and DAN T. SEHLBERG, from Sweden, in conversation about the internationally so widespread fascination of Scandinavian crime fiction, while they were in Ottawa presenting their new books: Peirced: A Novel (The Henning Juul Series) by Thomas Enger (Faber&Faber, 2012); The House that Jack Built (House of Anansi, 2014) by Jakob Melander; and Mona. A Novel by DAN T. SEHLBERG (Scribe Publishing, 2014). litnews1pod61 Highlights of the Ldeipzig Book Fair 2014. CKCU LitNews-1PODCAST – Episode 43 > Young British poets in conversation: REBECCA PERRY, CALEB KLACES and WARSAN SHIRE with Andrew McMillan; and JULIA COPUS with Robert Seather. Two podcasts aired on CKCU-FM radio with the permission of The Poetry Trust. CKCU LitNews-1PODCAST – Episode 42 > BILL KIRTON, the award-winning author of crime and mystery novels, in conversation with fellow writers at the St Clémentin Literature Festival 2012. CKCU LitNews-1PODCAST – Episode 41 > A Special CKCU fundraising broadcast with senior correspondent and literary critic FRIEDERIKE KNABE in conversation about this year’s winners of the Man Booker Prize, and Deutscher Buchpreis. CKCU LitNews-1PODCAST – Episode 40 > JEAN-JACQUES ROUSSEAU (1712-1778) : a tercentennial special broadcast, created, written and narrated by Dr. RAY ORTALI, professor emeritus, University at Albany – SUNY. CKCU LitNews-1PODCAST – Episode 39 > KERRY DWYER, author, reporting on the St Clémentin Literary Festival in Poitou-Charente (France), followed by Dr. JOLANTA WROBEL BEST on comparative literary studies. CKCU LitNews-1PODCAST – Episode 38 > SARAH MOSTREL, writer, poet, musician – in conversation (aired 9/11/2012). CKCU LitNews-1PODCAST – Episode 37 > In remembrance of HERMANN HESSE (1877-1962): a radio essay by Dr. Klemens Klemmer. CKCU LitNews-1PODCAST – Episode 36 > The summer program: Heading for the open! CKCU LitNews-1PODCAST – Episode 35 > The season’s finale: a special blend of music and poetry. CKCU LitNews-1PODCAST – Episode 34 > Our correspondents reporting on LitCologne 2012, the Prague Book fair, and about the City2City Literature festival in Utrecht. CKCU LitNews-1PODCAST – Episode 33 > Part II of the feature interview with VANESSA GEBBIE. CKCU LitNews-1PODCAST – Episode 32 > Part I of a feature interview with VANESSA GEBBIE, winner of the Daily Telegraph ‘Novel in a Year’ Competition for The Coward’s Tale (Bloomsbury 2011, paperback 2012). CKCU LitNews-1PODCAST – Episode 31 > Feature interview with STEVE SEM-SANDBERG, the award winnig Swedish author of De fattiga i Łódź (Augustpriset 2008), transl. into many languages; Engl.transl. The Emperor of Lies (2009). CKCU LitNews-1PODCAST – Episode 30 > Friederike Knabe in conversation about EUGEN RUGE (German Book Prize 2011) and FRIEDRICH CHRISTIAN DELIUS (Georg-Büchner-Preis 2011). CKCU LitNews-1PODCAST – Episode 29 > Robert Richard presenting “Three Ironic Twists in A Dangerous Method“: Sigmund Freud, Sabina Spielrein und Carl Gustav Jung revisited in the light of DAVID CRONENBERG’s film. CKCU LitNews-1PODCAST – Episode 28 > To honor WISLAWA SZYMBORSKA (2 July 1923 – 1 February 2012), Nobel Laureate in Literature (1996), a special contribution by Dr Jolanta Wrobel Best. CKCU LitNews-1PODCAST – Episode 27 >Take-off to the New Year On the wings of desire with Franz Schubert’s Fantasia in C major, D. 934, and poems by Musset, Eichendorff, Baudelaire, Mallarmé, Rossetti, and Pound, thanks to five readers who are in marvelous voice. CKCU LitNews-1PODCAST – Episode 26 > A tribute to Václav HAVEL 1936-2011; followed by a discussion on Julian BARNES (Booker Prize, 2011) and Boualem SANSAL (Peace Prize of the German Book Trade, 2011). CKCU LitNews-1PODCAST – Episode 25 > Paul VARNAI in conversation about Jewish culture in Hungary today. CKCU-LitNews-1PODCAST – Episode 24 > Tomas TRANSTROEMER reading, in 1987, from his books of poetry. CKCU-LitNews-1PODCAST – Episode 23 > Special broadcast about Tomas TRANSTROEMER, Nobel Prize in Literature, 2011. CKCU-LitNews-1PODCAST – Episode 22 > Jolanta Wrobel Best’s feature report about the Polish poet Adam ZAGAJEWSKI. CKCU-LitNews-1PODCAST – Episode 21 > Jara Rakusan in conversation about recent Czech women’s fiction and aspects of sociocultural developments in the Czech Republic. CKCU-LitNewsPODCAST – Episode 1 > Dr. Roseann Runte, President & Vice Chancellor of Carleton University in conversation. CKCU-LitNewsPODCAST – Episode 2 > Presentation of the program; Matthew Crosier, CKCU Station Manager, in conversation. CKCU-LitNewsPODCAST – Episode 3 > The Nobel Prize in Literature 2010; the ‘Georg Büchner Preis’ 2010. CKCU-LitNewsPODCAST – Episode 4 > Prof. A.T. Tolley in conversation about Larkins Jazz. CKCU-LitNewsPODCAST – Episode 5 > The EU Christmas Concert 2010 in Notre Dame Basilica, Ottawa. CKCU-LitNewsPODCAST – Episode 6 > The ‘Prix Goncourt 2010’ and other major literary awards in France. CKCU-LitNewsPODCAST – Episode 7 > The ‘Premio Miguel de Cervantes‘ 2010; EU Prize for Literature 2010. CKCU-LitNewsPODCAST – Episode 8 > Literary news from Madrid. CKCU-LitNewsPODCAST – Episode 9 > Theatre life in Warsaw and in Sofia 2011. CKCU-LitNewsPODCAST – Episode 10 > Czeslaw Milosz (1911-2004; Nobel Prize in Literature, 1980). CKCU-LitNewsPODCAST – Episode 11 > The ‘Shakespeare Authorship Debate’ reconsidered by Robert Richard. CKCU-LitNewsPODCAST – Episode 12 > Spanish perspectives on Edinburgh, UNESCO City of Literature. CKCU-LitNewsPODCAST – Episode 13 > Semmy Stahlhammer reads from his book Codename Barber / My Father’s Story (2007 / 2010). His father, Mischa Stahlhammer, was a Polish resistance fighter during World War II. CKCU-LitNewsPODCAST – Episode 14 > Fernando Savater, philosopher, literary critic and novelist, in conversation. CKCU-LitNewsPODCAST – Episode 15 > Bernhard Schlink, author of The Reader (novel, 1995; film, 2008) in conversation; part 1. CKCU-LitNewsPODCAST – Episode 16 > Bernhard Schlink in conversation, part 2. CKCU-LitNewsPODCAST – Episode 17 > Our tribute to Jorge Semprún (1923-2011); Friederike Knabe in conversation about Jenny Erpenbeck’s novel Visitation (2008). CKCU-LitNewsPODCAST – Episide 18 > Friederike Knabe in conversation about Jenny Erpenbeck’s recent fiction. CKCU-LitNewsPODCAST – Episode 19 > Celebrating EUGENIO MONTALE (1896-1981, Nobel Prize for Literature 1975) in conversation with ANTONINO MAZZA, Canadian poet and translator of Italian descent, reading from Montale’s Ossi di seppia and his translations. CKCU-LitNewsPodcast – Episode 20 > The Season’s Finale featuring ANTONINO MAZZA, and VESSEL the upcoming slam poet Michael Azonye. This is the RSS Subscription Link to the podcast episodes of Radio CKCU-FM 93.1 Literary News .